A blast of Winter came to Colorado over the last few days; snow, cold and wind. Now I actually like cold and snowy weather; it can provide beautiful and challenging photography, but my senses were still accustomed to the wonderful warm days of Indian Summer in Colorado that were present just days before the storm . This morning, as I scraped the ice off my truck in 16 degree temps, my mind wandered back to my summer excursions, particular to a trip I made in July to Oklahoma when the temperatures went over 100 degrees. On one day I spent a wonderful morning at the Tallgrass Prairie Preserve in the Osage Hills of Northern Oklahoma and was able to capture a great sunrise. Conditions were perfect with incredible verdant green grass and wonderful clouds in the sky that lit up as the sun hit the horizon. Viewing it certainly warms me up and brings back wonderful memories. Isn’t that why we all make photographs? One of my absolute favorite photographic subjects are intimate compositions of grasses. Finding and making these “Tapestries of Grass” is a joy but also a challenge to extract an image from an environment that at quick glance may seem mundane or even chaotic. The secret I believe in making any good intimate landscapes is to slow down and really look at the environment around you. When I am out I will often just stop and stand still for several minutes, scanning the surroundings and watching the light. More often that not something will catch my eye. I look for patterns, textures, and colors and if it strikes me I set up the tripod and precisely fine-tune the composition. If it all comes together I make the photograph, if not I move on. The following image made in Kansas at the Webster Wildlife area is a good example. It was made from spending at least 30 minutes wandering and looking in an area of prairie less than acre in size. I have been processing more images from the Tall Grass Prairie Preserve. This image was made in the afternoon before the image I posted on Monday. A storm system was building to west and the soft cloudy low contrast light made the colors of the Indian grass and Goldenrod almost glow. The interesting sky and clouds provided a good contrast to the layers of prairie grass and flowers. 2009 Visions of the Flint Hills: Preserving the Tallgrass Prairie Art Exhibit and Sale. I am very pleased to announce that two of my photographs have been juried into the Kansas Park Trust -2009 Visions of the Flint Hills: Preserving the Tallgrass Prairie Art Exhibit and Sale. The show will be held at the Buttonwood Art Space in Kansas City, MO from Oct 2 to December 5, 2009. The two images are Kansas Summer Prairie Sunrise and Kansas Winter Prairie. I will be present at the opening on Oct 2. One of the main subjects I am drawn to now in my journey to photograph the beauty of the natural world is the prairie, and the amazing textures and colors of grass that make up this often unappreciated environment. True, the prairie and plains are relief challenged environments and they may not bring to mind the incredible vistas of rugged alpine terrain, but I personally have found that if you take the time to experience the prairie and really see it you would be astounded at the beauty that is present. One of the goals of this web journal will be to highlight my vison of the prairie and hopefully illustrate that the beauty of nature extends well beyond spectacular the red rock country of the southwest or the unquestionable grandeur of the mountain environment. To that end I present the next image from my recent Midwest trip. 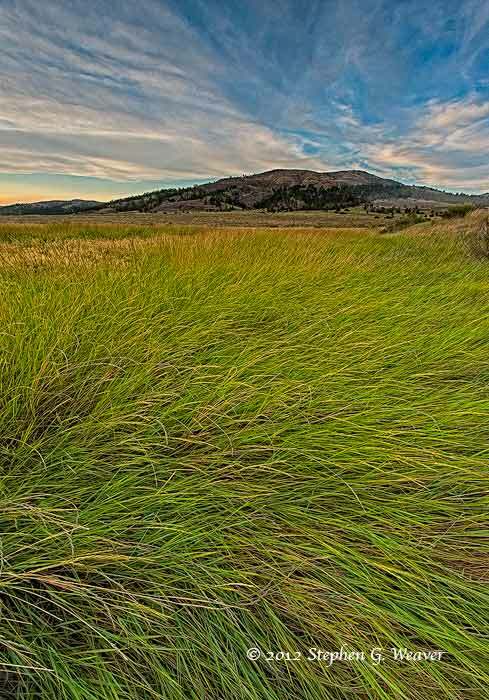 Photographed in the Sand Hills of Nebraska in Crescent Lake NWR, this image highlights the luxuriant growth of grass surrounding one of the many lakes in the refuge. I was blessed with great clouds and soft light and the different layers and textures as well as the near-far composition help to make this a satisfying image.